A customer once said, “They're so dark they look like they’re made of chocolate”. The Camacho Triple Maduro are as Maduro as it gets, in fact this hand-rolled premium cigar is the only all-Maduro cigar produced in the world. Honduran, Dominican Republic, and Brazilian are the fillers, with authentic Corojo Maduro binders and sealed up with a dark San Andres Maduro wrapper grown in Mexico. 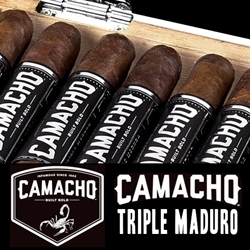 Camacho handmade Triple Maduro cigars are built so bold that upon ignition, they give a full smooth smoke while retaining a great creamy aftertaste. Cozy up to the fire with friends, your favorite after-dinner drinks, and Camacho Triple Maduro's in hand. Now that’s an evening! Check out all the styles available here today for a discount price! Call us for more details!